In the endless barrage of the 24-hour news cycle, ongoing cultural tensions and ecological problems in our rapidly globalizing world break through the noise with great urgency. From the rise of nationalist movements worldwide to the alarming frequency of mega-storms and other natural disasters, such events resonate with long-term, planetary implications—and call for new ways of thinking about how we got here and where we’re headed. 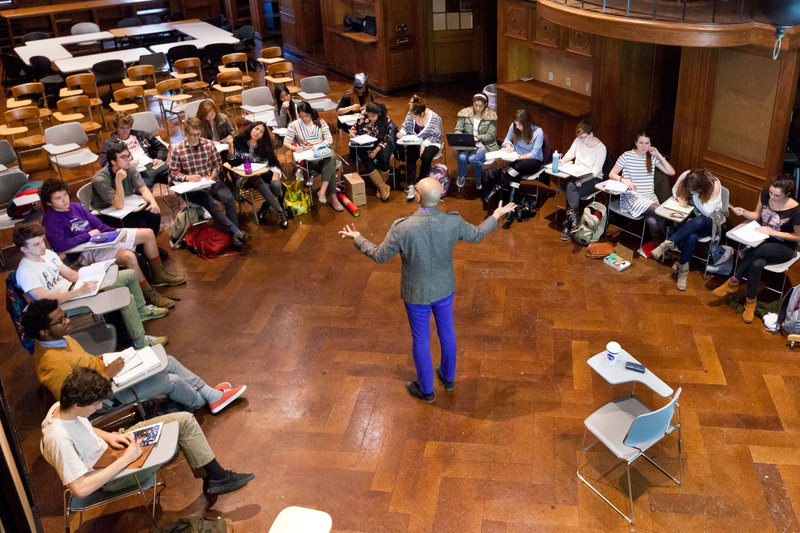 Discovering new ways of critically addressing these issues is a cornerstone of RISD’s first-ever graduate programs in Liberal Arts: in Global Arts and Cultures (GAC) and Nature–Culture–Sustainability Studies (NCSS). Launching in fall 2018, these 1.5-year Master of Arts programs invite students to explore the significance of the arts and cultural production within a dynamic, highly interdisciplinary framework. All RISD students take liberal arts classes, but GAC and NCSS are the first two degree programs offered through the division. As the first to pursue a liberal arts major at RISD, graduate students in GAC and NCSS will form “a community of conversationalists” whose intellectual interests closely align with students in studio majors, says Professor Nicole M. Merola, who leads the NCSS grad program. “This is a new way of preparing students to take on urgent issues [and] to visualize cultural practices as they evolve in the future,” she explains. 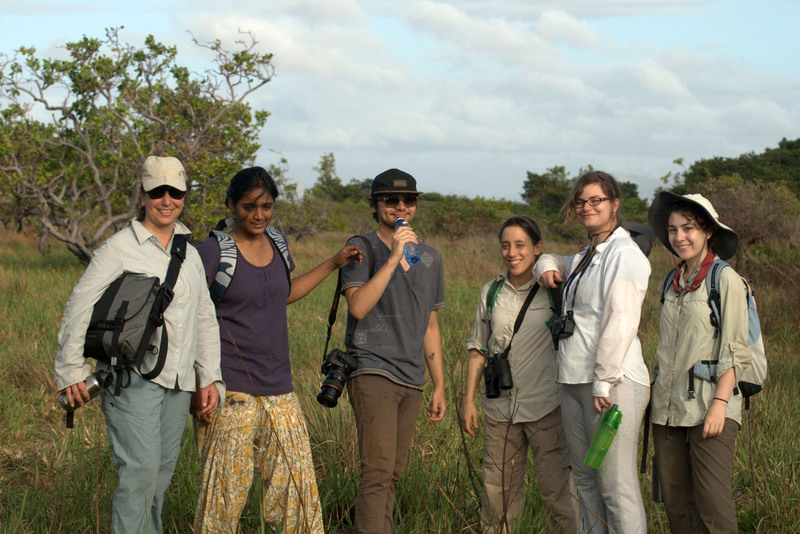 Emerging from an undergraduate concentration that began three years ago, the NCSS MA program asks students to consider socio-ecological issues like climate change from different perspectives in the humanities and social sciences. The curriculum covers a diverse range of topics—from the relationship of the environment to global politics and human rights to how speculative designers address sustainability in their work. “Climate change is the problem of the 21st century,” says Merola, whose research focuses on issues at the intersection of science, literature, art and several other topics in the environmental humanities. She is confident that the combination of RISD’s art-and-design context and its emphasis on cross-disciplinary collaboration in the liberal arts will inspire students to “ask new questions” and introduce much-needed alternatives to thinking about nature, culture and sustainability. Like the NCSS grad program, GAC underscores the importance of working across several fields to create rigorous scholarship that can also reach a wide variety of audiences. Encompassing a broad spectrum of cultural objects, practices and processes, the program offers a foundation in critical global studies and supports focused research in such areas as modern and contemporary arts criticism, museum and exhibition cultures, and the relationship between aesthetics and politics. “The program encourages students to adopt global ways of thinking,” says GAC Graduate Program Director Eric Anderson, adding that teaching at RISD has had a significant impact on his work in art history. “I am constantly considering the larger intellectual field of art history in the context of studio disciplines and other fields in the humanities and social sciences.” He also notes that RISD’s Liberal Arts division has grown in recent years to include even more diverse perspectives on global arts and cultures. Through NCSS and GAC, RISD is extending its advocacy for the transformative power of the arts into new academic territory, notes Provost Pradeep Sharma. “They offer brave, complex approaches to complex problems,” he says, and through interactions with RISD’s community of makers, students in these programs will learn alongside “the new painters, the new sculptors,” giving them unique opportunities to influence the future of creative practices through their own research. Visiting artists such as Shahzia Sikander MFA 94 PT/PR help keep conversations about identity and global culture front and center at RISD. 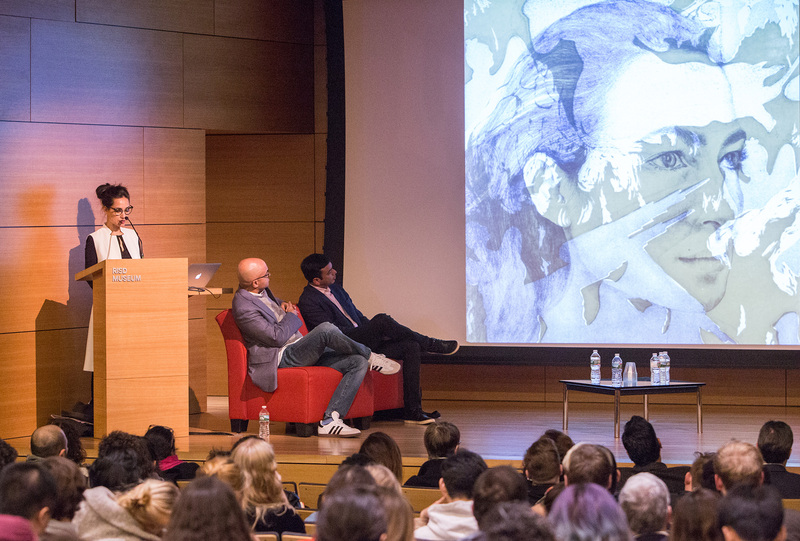 As the first speaker in RISD’s Community Dialogues series, activist and author Jeff Chang urged students to make art that advocates for social justice. An exhibition featuring the work of students participating in RISD Global programs frames travel as both a catalyst and a point of connection.